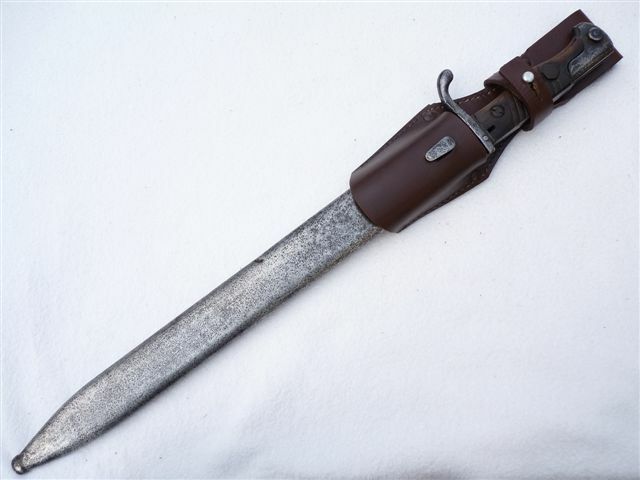 This is the infamous 'Butcher sawback' bayonet as used by the pioneering troops of the Germany Army during WW1. Also carried by NCOs as a symbol of rank, the object of the sawback teeth was for clearance of light branches and brush, not for the inflicting of more horrific injury as wartime propaganda had made out. 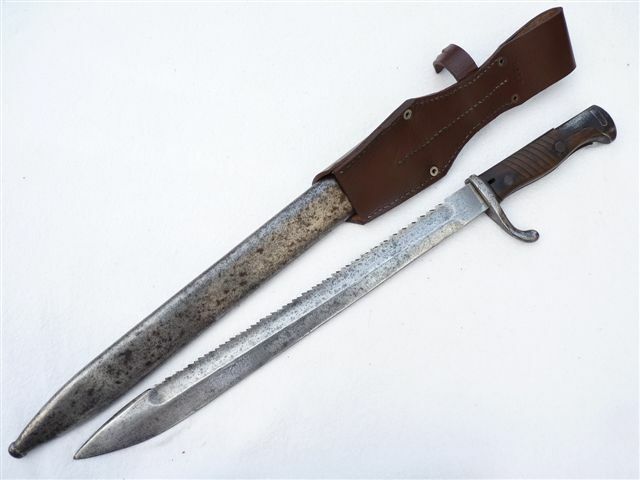 Full designation for this bayonet is S (Seitengewehr meaning side-arm) 1898/05 S n/A. 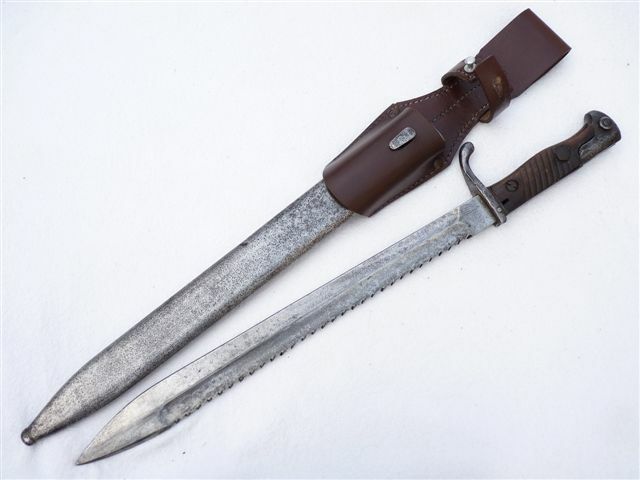 1898 being the year of introduction of the basic bayonet and 1905 the year of modification to that current form. S stands for the german word for sawback, and n/A stands for 'neuer Art', meaning 'new type' or 2nd type, due to reduced muzzle ears and flashguard above the grips. 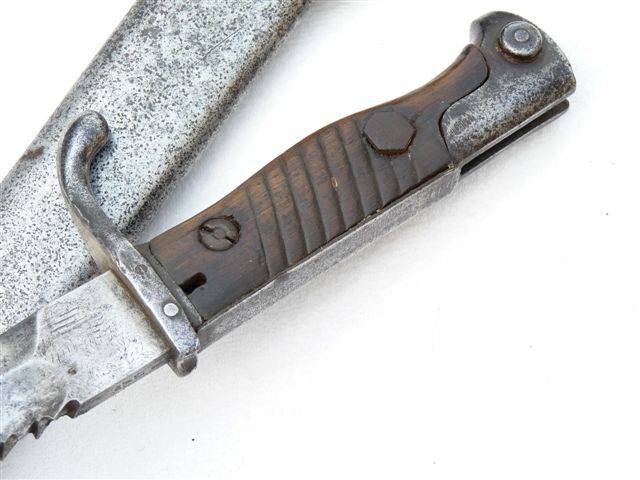 Production of this n/A bayonet was from 1915 to 1917 only.This particular example is a 1917 model in good overall condition, with a good scabbard and reproduction frog. The pictures tend to exaggerate the condition of the steel, which although marked is only lightly pitted on one side and could be improved. The blade itself has a good edge, point and sawback teeth. There is the faint maker's mark of Waffenfabrik Mauser AG, Oberndorf on the ricasso, and W17 on the spine along with Imperial inspection mark on spine and pommel. The wooden grips are complete and there appears to be a field repair to one of the studs. It is a very old repair and I would say carried out during it's service life. Sound release button. Scabbard complete and sound, only a couple of dings on one edge as can be seen. 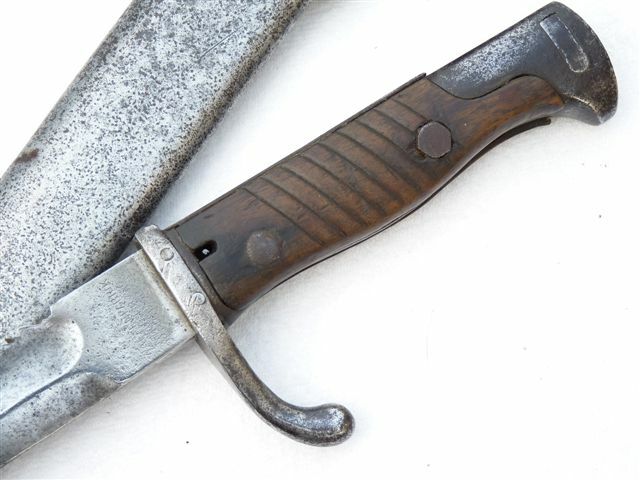 A rare and desirable WW1 bayonet.